And printed "Puck You" and "10" on the front. Features a black shirt and skirt set with purple and silver trim, white stars on the sleeves. Waist: 25"-28". ( 91-97 cm). Black/White, One Size. Bust: 32"-38". Waist: 24"-32". Dress Size: 2-12. Due to health concerns, sanitary reasons and the nature of our products, we are unable to accept used and opened products. Sleeve Length Short Sleeve. •You can find various designs and suit for female of any age. Size:One size can fit around M/US 4-6. Size Type Regular. There maybe 1-2 cm deviation in different sizes, locations and stretch of fabrics. Includes:Black and white striped zipper back mini skirt, Black and white striped halter style crop top with "69" patch on front and has adjustable strap in back. Made of 100% polyester. 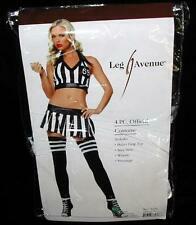 Made by Leg Avenue. Collection : Rumba Shorts. No picture Manufacture cardboard. Color : Purple. Vivace Touch Down Babe Ensemble. 90% Polyester and 10% Spandex. Black, One Size. Bust: 32"-38". Waist: 24"-32". Poly knit (Black & Lilac) 2 pc shirt and skirt set with printed silver stars and number "10". Adult size: 1X / 2X (16-18) Bust 40-46" Waist 36-40". We'll do everything possible to rectify the problem. Vivace Touch Down Babe Ensemble. Material: 90% Polyester and 10% Spandex. Bust: 32"-38". Waist: 24"-32". Dress Size: 2-12. This is the sexiest 'Ref' you will ever see. Includes- pleated skirt with zip up front with socks and whistle. Dress Size. 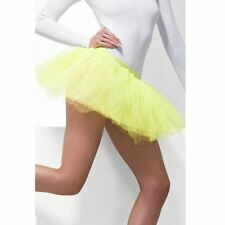 The Neon Yellow Layered Petticoat. Total length of layered petticoat from waist band to hem approx 12"/31cm. Adult Accessory: One Size. Make Up & Face Paint. Sponge clean only. Keep away from fire. 100% polyester. Tutu Underskirt. Neon Yellow, 4 Layers, 30cm Long. 60s, 70s and 80s. We will always strive to solve any issues you may have. One size fits up to a size 16. Film and TV.